An ambiguous, awkwardly articulated fear of something like a homegrown, newly powerful religious right would explain the jarring preoccupation with both religion and religious imagery (churches, crucifixes, prayers, priests, temples) that is this exhibition’s hallmarkand that certainly comes as a surprise to those viewers familiar with the politically progressive curatorial track record of Esche and company. Aren’t religious phenomena a fraudulent distractiondevious superstructural effects of underlying base dynamics? Isn’t religion the opiate of the masses? In this sense, the ambivalence coloring the curators’ rhetoric regarding the “recognition of the power of faith and ritual to change normative responses” feels oddly defeatist. Isn’t the “power to change” something we are supposed to expect from art? Two signature works in the exhibition are emblematic of this tension. One is Yael Bartana’s video Inferno, 2013, its location on the top floor of the iconic Matarazzo pavilion indicative of the centrality of organized religion to the program of the biennial. 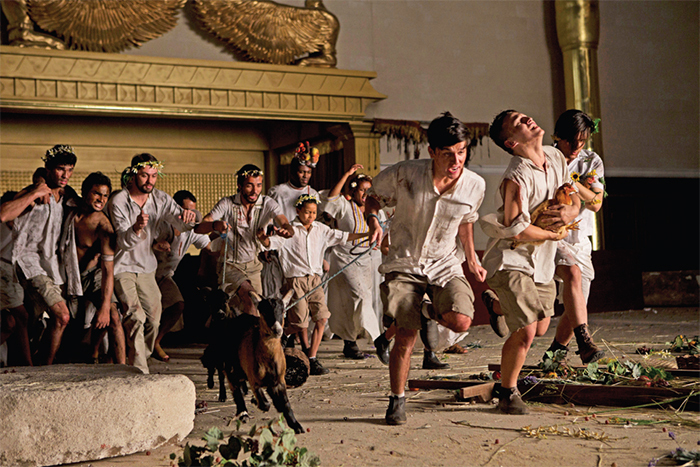 In it, the Israeli artist reimagines the violent destruction of the Temple of Solomon in the sixth century bc, using as a setting an outsize replica of the temple that was recently built by a Brazilian neo-Pentecostal church on the outskirts of São Paulo with stones imported from Jerusalem. Shot with high production values and epic bombast, the piece is unironically symptomatic of a belief in the “power of faith and ritual.” Elsewhere, a much more modest and sober offering manages to exert a more powerful effect: The Excluded. In a moment of danger, 2014, a film by theRussian–based collective Chto Delat, thoughtfully, and without hyperbole, tackles the various dangers, disappointments, and failures besetting everyday Russian life in a series of stripped-down theatrical vignettes, its stoic avoidance of melodrama reminiscent of good old critical art. (Historical works by Juan Downey, León Ferrari, and Juan Carlos Romero corroborate the resulting impression that a direct political address is, regrettably, largely a thing of the past.) This is not to say, of course, that this biennial’s preoccupation with faith and ritual fails to produce its fair share of epiphanies: Juan Pérez Agirregoikoa’s video Letra Morta, 2014, revisits Pier Paolo Pasolini’s 1964 film The Gospel According to St. Matthew by switching the action from Palestine to a suburb of São Paulo; A família do Capitão Gervásio (Captain Gervasio’s Family), 2013, by Kasper Akhøj and Tamar Guimarães, continues the latter’s ongoing film-based investigation of the history of folkloric spirituality in her native Brazil, this time intertwined with an homage to the country’s formidable legacy of modernist architecture; and Virginia de Medeiros’s Sérgio e Simone, 2009–14, also a video (there is no shortage of moving images in this biennial), charts the entertaining trials and tribulations of Simone, a transvestite who guards a natural spring in the Brazilian city of Salvador, and Sérgio, an evangelical preacher hailing from the same neighborhood who claims to be tasked by God with saving the human race from the kinds of destructive desires personified by the likes of Simone (interestingly, Sérgio and Simone are one and the same person, before and after, filmed a couple of years apart). 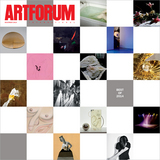 Shades of gender trouble, in fact, thread a subtle counternarrative throughout the biennial, infusing the exhibition with a certain libidinous charge where needed while simultaneously complicating such simplistic polarizations as politics versus religion, body versus mind, and matter versus spirit. This undercurrent allowed the show to be read against the grain, salvaging the allusive potential of its formal title, “How to ( . . . ) things that don’t exist.” For example, an entire exhibition-within-the-exhibition, “Dios es marica” (God Is Queer), organized by Peruvian curator Miguel A. López and including self-portraits by Mexico’s Nahum Zenil and Franco-era Spanish drag artist José Pérez Ocaña, among others, occupies a central position in the biennial’s trajectory, as do the samplings of comparable work by São Paulo–based artist Hudinilson Jr. and Peruvian philosopher and drag queen Giuseppe Campuzano, whose ambitious Línea de vida/Museo Travesti del Perú (Life’s Timeline/Transvestite Museum of Peru), 2009–14, a fictional museum, is one of many things in the biennial“that don’t exist”yet. Let us maintain our faith in the power of art to articulate and propose things that don’t exist but really shouldand, in turn, let us temper our faith in the power of faith: It isn’t faith that moves mountains, after all, but people. Dieter Roelstraete is a curator at the Museum of Contemporary Art Chicago. Abigail Winograd is a curator and writer based in Chicago.